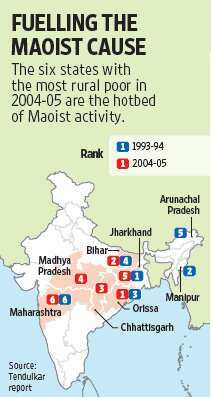 Low rural poor count key to Maoist wave? New Delhi: The number of poor people in India has been underestimated and the six states with the most rural poor are coincidentally those that are plagued by Maoist insurgency, which the government has singled out as the country’s biggest internal threat. It also shows that the proportion of poor in urban areas is substantially lower than that in rural India; while little over one in four people are poor in urban India, the proportion is four out of 10 in rural areas. The report was authored by an expert group appointed by the Planning Commission and chaired by Suresh Tendulkar, former chairman of the National Statistical Commission. Mint had first reported the preliminary findings of the report on 21 August. The expert group revised and expanded the norms that define people living below the poverty line (BPL); it was mandated to calculate the poverty line and the proportion of the population below it, and if required, redraw the line itself. The group completely reordered the norms by doing away with the upper bound for the calorie count per person (the predominant parameter in earlier definitions of poverty), standardized the price indices and at the same time expanded the criteria to include education, health and actual spending on rent and conveyance as part of an individual’s consumption basket. And it used the same criteria for rural and urban poor—the first time this was done. “Why not? Today a host of items like, say, cellphones are no longer an urban preserve. We are seeing a gradual merger of rural and urban aspirations," said an economist, who did not want to be identified. Montek Singh Ahluwalia, deputy chairman of the Planning Commission, said he would not be able to comment on the report because he hasn’t read it extensively. 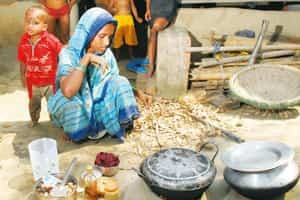 Conventionally, poverty in India has been measured through a minimum household consumption level estimated by the National Sample Survey Organisation, part of the Central Statistical Organisation, the country’s apex statistical body. This measure was anchored in the per capita calorie norms of 2,400 (rural) and 2,100 (urban) per day. The existing official poverty line was originally defined in terms of per capita total consumption expenditure at 1973-74 prices. This is periodically updated by an expert group, using state price indices. However, the calorie count—which measures individual consumption— assumed in the original poverty line in 1973 has not changed. Nor has the original reference basket of goods and services defined in 1973-74. The expert group has abandoned this approach. Based on this new criteria, the group revised the previously estimated poverty figures. Accordingly, poverty at the all-India level in 1993-94 was 50.1% in rural areas, 31.8% in urban areas and 45.3% in the country as a whole, compared with the 1993-94 official estimates of 37.2% rural, 32.6% urban and 36% overall. Similarly, the new estimates for poverty in 2004-05 are 41.8% rural, 25.7% urban and 37.2% all-India, compared with the official estimates for the same year of 28.3% rural, 25.7% urban and 27.5% overall. Yogendra K. Alagh, an economist who chaired the earlier task force on poverty, said the benchmark had been raised under the new poverty definition, which explained why the number of poor according to it have increased. According to him, while earlier poverty estimates were done from a pro-poor point of view, which assumed that the state would take care of education and medical facilities, the new measure is based on inclusive growth, which suggests empowering people with more money to purchase what they can from the private sector. “The Planning Commission, however, needs to address this problem carefully," he added. Should “the government build rural infrastructure" through projects such as Bharat Nirman “or increase purchasing power of the poor"? The change in poverty lines has also implied that the headcount of poor in each of the 28 states has changed. The ranking of the states with the most rural poor is revealing, as they are also those that have witnessed enhanced militant activity by Maoists. On 11 October, Prime Minister Manmohan Singh declared: “Naxalism is the greatest internal threat." Experts say that the new poverty numbers reflect emerging inequalities in the country—in terms of incomes as well as the difference between rural and urban regions. An expert said that the numbers call for more spending by the government. N.R. Bhanumurthy, a professor at the New Delhi-based National Institute of Public Finance and Policy, said: “I also feel that the new numbers clearly call for higher fiscal expenditure on rural development, which will help bridge the dichotomy. Besides, expenditure on education and health must have given rise to higher figures of poverty, though I don’t think expenditure on rents would have made a difference in rural areas, which is a reality today as public spending on these facilities have been low." S.L. Rao, former director general of the National Council of Applied Economic Research, said that while poverty would go down, the bigger worry is inequality, which seems to be increasing.